The statutory instrument Companies, Partnerships and Groups (Accounts and Reports) Regulations 2015 (SI 2015/980) came into force in April 2015, implementing the EU Accounting Directive. These changes to UK law apply to financial years beginning on or after 1 January 2016. These company law changes include the option for small companies to prepare Abridged accounts and the withdrawal of the option to file an Abbreviated version of the accounts. Abridged accounts should not be considered a replacement of Abbreviated accounts. There is an option available to small companies to prepare Abridged accounts. These would be the only set of accounts prepared for the members and HMRC, and are an alternative to the full accounts, not an additional report. These accounts must give a true and fair view. There is an option to draw up an Abridged Income statement and/or Abridged Statement of financial position. The Abridged Income statement can begin at Gross profit omitting the Turnover, Cost of sales and Other operating income items. The Abridged Statement of financial position can omit the numbered items on the format of accounts, therefore just disclosing letters and roman numerals. This means that the face of the Statement of financial position remains the same but some of the relating notes can be omitted, namely, Debtors, Current asset investments, Creditors. In addition, the Fixed asset note can be simplified to a single note. Abridged accounts can be prepared only if all of the company’s members consent and that consent must be obtained for each financial year. The directors must deliver a statement of consent to Companies House confirming that all of the members have consented to the preparation of the Abridged accounts. Sage Final Accounts supports filleted accounts in accordance with Section 444 of the Companies Act 2016. When filing accounts at Companies House the filleted option is more useful with the withdrawal of the option to file an Abbreviated version of the accounts. Small companies essentially file what is prepared for its members, being full accounts or Abridged accounts. The filleted option allows small companies to file the copy of the accounts they prepare for members, omitting the Income statement and related notes and/or the Directors report. Abridged accounts seem an attractive option for small companies but bear in mind that the Income statement does not need to be filed with Companies House and members may still want a full set of accounts with a full Income statement. 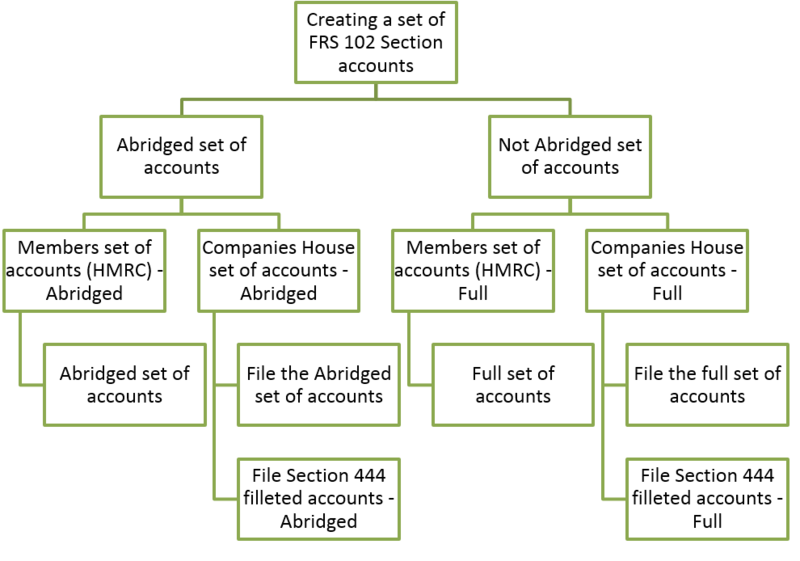 The Abridged accounts options can be found when creating a new set of accounts and selecting the compliance pack required. These options can be changed at any time within the period options (Sets of Accounts Options > Period options).